Discount parking nearby Hudson River Park is available at the following Parking.com locations. Click on a parking location to print a parking garage coupon with special discount parking rates for any 6, 12 or 24 hour period. A parking coupon is required to receive these discount rates for parking, so be sure to bring one with you. Hudson River Park includes over 550 acres along the Hudson River, starting near Chamber St and running through 59th St. It includes Restaurants & Shopping, as well as the following activities: Baseball, Basketball, Beach Volleyball, Bicycling, Boat Excursions, Bowling, Dog Runs, Field Sports, Golf, Kayaking, Mini Golf, Rock Climbing, Rowing, Running, Sailing, Skate Parks, Swimming, Tennis, and Walking Tours. 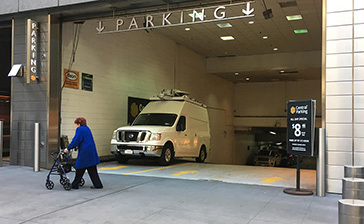 Parking.com has convenient parking garages throughout the NYC metro area! Click to find more NYC Parking.